How Long Should a Pancake Cook on Each Side? Each side should have a gold color when finished. The time it takes to cook a pancake on each side isn't an exact science -- mostly because of variations between griddles and pans -- but you can easily look for a telltale visual clue that shows you when the time is right. 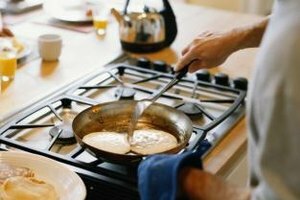 By watching your pancakes carefully and using the right flipping strategy, you can prevent undercooking or scorching your breakfast. Using a lightly oiled pan or griddle over medium-high heat, the average pancake takes between two and three minutes per side to cook. Though you can use that as a general guide, the better method to ensure an evenly cooked, fluffy pancake is to monitor it as it cooks. While the first side of the pancake cooks, bubbles start to form on the surface of the exposed side -- first along the edges and then in the middle. When the bubbles start forming in the middle, flip the pancake. Because the above method doesn't work for the second side, use the time it took to cook the first side as a guide. When you're getting close, use your spatula to gently lift the pancake and take a peek to look for the golden coloring of a finished flapjack. How Long Do You Bake Pastelitos?